cRadiology (Y.Z., H.Q., S.H., M.W. )hChongqing Medical University (S.H. ), Traditional Chinese Medicine College, Chongqing, China. SUMMARY: Magnetic particle imaging is an emerging tomographic technique with the potential for simultaneous high-resolution, high-sensitivity, and real-time imaging. Magnetic particle imaging is based on the unique behavior of superparamagnetic iron oxide nanoparticles modeled by the Langevin theory, with the ability to track and quantify nanoparticle concentrations without tissue background noise. It is a promising new imaging technique for multiple applications, including vascular and perfusion imaging, oncology imaging, cell tracking, inflammation imaging, and trauma imaging. In particular, many neuroimaging applications may be enabled and enhanced with magnetic particle imaging. In this review, we will provide an overview of magnetic particle imaging principles and implementation, current applications, promising neuroimaging applications, and practical considerations. Magnetic particle imaging (MPI) is a new tomographic technique developed in the early 2000s.1 In contrast to traditional imaging modalities such as MR imaging, sonography, x-ray, and CT, MPI is not a structural imaging technique. Instead, it is a tracer imaging technique similar to PET and SPECT. MPI allows tracking and quantification of tracer materials, specifically magnetic nanoparticles. It is a quantitative 3D imaging technique with high spatial and high temporal resolution, which may allow real-time high-resolution in vivo imaging. Prototype scanners and, more recently, commercial animal scanners have yielded the first in vivo MPI studies demonstrating applications in vascular imaging,2⇓–4 oncology,5⇓–7 and cell-tracking.8,9 Human scanners are being developed and will become available in a few years. As an emerging imaging technique, MPI may open up new possibilities in 3D in vivo real-time imaging. In this review, we will introduce the principles and applications of MPI for researchers and clinicians in the neuroimaging field. We will start with a basic description of the physics and construction of MPI, then talk more in depth about the current applications and discuss promising neuroimaging applications. We will also include practical considerations and comparisons with other imaging modalities for reference. MPI uses a magnetic gradient field, known as a selection field, to saturate all superparamagnetic iron oxide (SPIO) magnetization outside a central field-free region, known as a field-free point (FFP) or field-free line (FFL). The FFL is rapidly shifted over an imaging volume via a rapidly varying excitation/drive field to produce an image. Large fields of view are traversed using slower shift fields and mechanical translation. To produce a signal, as the FFL traverses a SPION's location, the SPION's magnetization changes nonlinearly in response. This time-varying magnetization induces a voltage in the receiver coil, which can be assigned to the instantaneous FFL location to produce a magnetic particle image. The voltages induced are linearly proportional to the number of SPIONs at the instantaneous FFL location, enabling quantification of SPIONs. Most importantly, biologic tissue does not generate or attenuate the low-frequency magnetic fields used in MPI, giving the technique ideal contrast independent of the source depth. These fields are further described in the On-line Appendix. The magnetic fields required for MPI are very different from those used in MR imaging, so MPI scans cannot be acquired on a standard MR imaging scanner. A magnetic particle imager has 3 major components: The main magnet subsystem generates the main magnetic field gradient and shifts the field-free region (FFR) to cover the full FOV, the transmit/receive subsystem generates the drive field and receives the signal produced by the nanoparticles, and the control console coordinates operation of the major subsystems and processes the received signal to produce an image.10 Typically, the main magnet produces both the selection field and the slow-shift fields, driving the native resolution of the system. The drive coils in the transmit/receive subsystem generate the excitation signals in the nanoparticles, and this subsystem is designed for decoupling much lower nanoparticle signals from the excitation/drive signal. These MPI scanner components are further described in the On-line Appendix. The Table provides a comparison of MPI with common clinical imaging modalities. The resolution of the technique is driven by the interaction of the nanoparticle and the gradient.11⇓–13 This drives the native resolution of the system, which can be expressed as full width at half maximum.13 For stronger gradient strengths such as 6.1 T/m used in a MOMENTUM system (Magnetic Insight, Alameda, California), tailored nanoparticles have been demonstrated to have ∼700-μm full width at half maximum resolution, and point sources remain distinguishable at a 600-μm separation.14 While the native resolution of a system derives only from interaction of the gradient and nanoparticle, there are numerous techniques for improving the visual quality of the images by trading the SNR of the technique for image resolution.15 These techniques are frequently used in MPI to good effect and can appreciably improve resolution for lower systems with lower gradient strengths.15 The resolution compares well with clinical nuclear medicine. For example, clinical PET cameras have a fundamental resolution limit of ∼2 mm, with a practical resolution limit of ∼2.5 mm,16, and typically SPECT has a resolution of ∼10 mm,17 though some systems have a resolution as fine as 3 mm (eg, G-SPECT; MILabs, Utrecht, the Netherlands). Currently the standard of care for cerebral blood perfusion imaging is CT perfusion, which poses ionizing radiation risks. MPI is well-suited for measuring perfusion. A study demonstrated imaging of cerebral blood flow in living mice using MPI.2 This was followed by a demonstration of MPI perfusion in mice for imaging stroke.3 In our work, we recently measured CBV and CBF in a rat.4 In addition, we performed in vivo cerebral blood perfusion in stroke mice with MPI (Fig 1), in which an intravenous bolus of iron nanoparticles was administered to mice. Tomographic 3D-MPI was performed using a MOMENTUM MPI system (Magnetic Insight). We showed that lower MPI signal (a measure of CBV) is observed on the side of the brain with the stroke lesion. Perfusion, structural, and histology images from a mouse injected with the nanoparticles. The parameters were the following: FOV = 4 cm, 35 projections, best image quality, Lodespin scan mode. A 70- to 100- L intravenous bolus of iron nanoparticles (0.949 mg Fe/mL; core diameter, 27.6 nm) donated by Dr Kannan Krishnan, University of Washington, was administered to C57Bl/6 stroke mice through tail veins. The mice were sacrificed within 30 minutes postinjection, and 3D-MPI was performed using a MOMENTUM MPI system. Anatomic images were collected on the eXplore CT-120 microCT (GE Healthcare, Milwaukee, Wisconsin) and a 7T MR imaging scanner (BioSpec; Bruker Instruments, Billerica, Massachusetts). Data analysis and image registration were performed using the Horos (https://sourceforge.net/projects/horos/) and VivoQuant software (Invicro, Boston, Massachusetts). In vivo iron oxide quantification was performed by imaging fiducials containing a known concentration of tracer positioned beside the animal. A, In the 2D coregistered image from CT and MPI, the MPI signal (red if high, yellow if intermediate, blue if low) from the left hemisphere is less than that from the contralateral side (red spots indicate vascular structures with high blood volume). B, The high T2 signal (stroke lesion, arrowheads) in the left basal ganglia and thalamus. C, The histology image of a perfusion-fixed whole brain shows the stroke lesion on the left (L). R indicates right. In neuro-oncology, conventional MR imaging and CT lack reliability in assessing the size and location of brain tumors, and they are often not specific enough to differentiate tumor progression from other treatment-related changes.33,34 While traditional PET for glucose metabolism is often used in peripheral tumor imaging, it cannot provide good contrast for brain tumors due to the high levels of glucose metabolism inherent in the brain, and novel tracers such as radio-labeled amino acids are required for better contrast.35 MPI may provide a promising alternative, especially as brain-specific MPI tracers are developed to improve specificity, enhance retention times, and reduce potential harm to the patient. These cell-labeling and tracking methods may also be applied to neuroimaging. In one study, it was shown that neural grafts could be monitored in rats. This study implanted neural progenitor cells into the forebrain of rats and measured nonsignificant signal decay during 87 days.18 The authors demonstrated a detection sensitivity of <1000 cells in a voxel. As commercial development continues, we estimate that the theoretic detection limit may approach as little as 1–10 cells in a voxel. For comparison, these numbers compare favorably with MR imaging, in which the first clinical cell-tracking detection limit was 15,000 cells.48 In a preliminary experiment, we administered SPION-labeled mouse macrophages to stroke mice to test the localization and retention of signals for stroke monitoring (Fig 2). We showed that while the accumulation of iron-labeled cells was highest at 48 hours, there was still detectable MPI signal at 96 hours postinjection. SPION-labeled macrophages have long retention times in the brain of a stroke mouse. We administered 1–2 × 106 nanoparticle (VivoTrax; Magnetic Insight)-labeled mouse macrophages (Raw 264.7; American Type Culture Collection, Manassas, Virginia) to BALB/c mice through tail veins 24 hours after stroke. At 48, 72, and 96 hours poststroke, 2D-MPI was performed using a MOMENTUM MPI system. The MPI protocol used the parameters of FOV = 4 cm, 55 projections, best image quality, and default scan mode. Anatomic images were collected on the eXplore CT-120 microCT. Data analysis and image registration were performed using the Horos and VivoQuant software. In vivo iron oxide quantification was performed by imaging a fiducial containing a known concentration of tracer positioned beside the animal. The MPI signal was detected in the brain at 48, 72, and 96 hours poststroke; the accumulation of iron-labeled cells was the highest at 48 hours and reduced with time. Inflammation is involved in many disease processes, including immune disorders, neurologic/neuropsychological disorders, and cancer. Detection and tracking of inflammation could help with diagnosis and monitor treatment outcomes. Unfortunately, current practices in tracking inflammation often involve biopsies or imaging methods that have low specificity and quantifiability. MPI may be a promising quantitative imaging alternative. Previous studies have already shown the use of SPIO tracers to target inflammation. SPIOs may be injected intravenously and may be taken up at inflammation sites, such as by macrophages at active phagocytic sites49,50 or by atherosclerotic plaques.51,52 Previous studies have used MR imaging to detect the SPIONs for inflammation tracking.49,50,53,54 However, with high magnetic susceptibility, SPIOs cause a decrease in signal intensity, which could often be confused with signal voids from bone, air bubbles, susceptibility blowouts, and imaging artifacts. With the use of MPI, SPIONs can be more specifically detected with a higher signal-to-noise ratio. SPIO contrast agents have previously been developed for MR imaging contrast enhancement. SPIOs are relatively safe for the patient and are biodegradable through the reticuloendothelial system.55 As mentioned previously, SPIO agents can achieve long retention times in the body up to hours or days when loaded into cells. In PET or SPECT, the radioactive tracers have shorter half-lives in the body, especially for the high-energy probes required in PET. In addition, due to the short half-life of PET tracers, PET requires a cyclotron on site. In comparison, the SPIOs used in MPI are much more stable and have longer shelf lives with lower production cost.56 There are a number of commercial SPIO agents that have either received FDA approval or are in a clinical trial phase57 to serve as potential contrast agents for MPI.58⇓⇓–61 SPIONs have historically been used in humans as MR imaging contrast agents, and 2 tracers, ferucarbotran (Resovist)and ferumoxytol, remain on the market in the European Union/Asia Pacific and the United States/European Union/Asia Pacific, respectively. These agents have been approved for contrast-enhanced MR imaging of the liver/spleen.62,63 MR imaging contrast agents can also be used for MPI. Additionally, development and synthesis of MPI-tailored contrast agents are an emerging and important field of research. The hardware complexity of MPI is comparable with that of MR imaging. One of the difficult engineering tasks is while MR imaging requires a parts-per-million accurate main magnetic field, MPI requires a parts-per-million accurate sinusoidal drive field.83 Both techniques require real-time control of magnetic fields and involve pulse sequences and reconstruction algorithms. In contrast to MR imaging, however, MPI scanning and imaging are straightforward, and we have not found that specialized training is required to acquire or interpret MPI. MPI contrast agents are widely available, easy to handle, and less expensive than commonly used radioactive probes. Like nuclear medicine, it can be helpful to have structural information with which to overlay MPI, and we frequently coregister MPI with CT and MR imaging. Thus, construction of hybrid systems to ease coregistration with anatomic images may be desirable in the future. MPI is a novel, promising imaging technique for sensitive, quantitative, and high-resolution in vivo imaging. 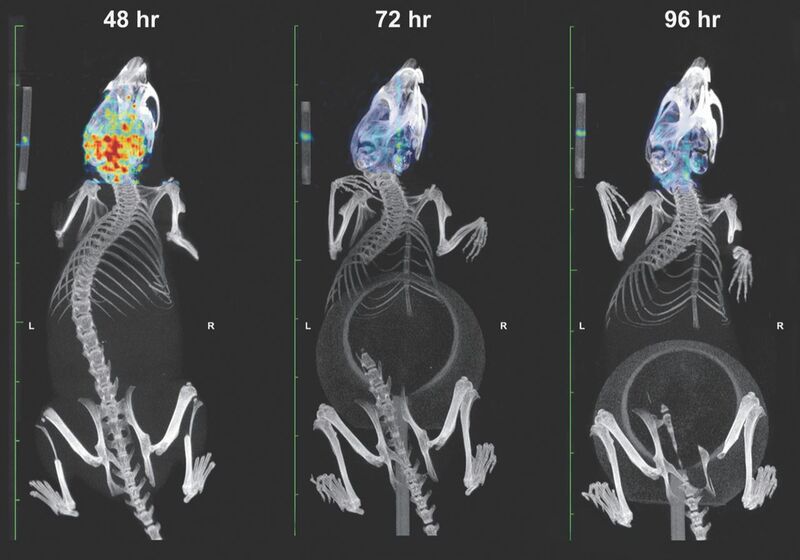 Preliminary animal studies have shown promising applications, including vascular imaging, oncology imaging, cell tracking, and inflammation imaging. Much development work is being done to further improve imager design, tracer design, and imaging protocols. With these improvements and the upcoming development of human-sized scanners, MPI has the potential to become a widely adopted clinical tool for neuroimaging. We would like to thank Anna Christensen, Patrick Goodwill, Jeff Gaudet, and Prachi Pandit from Magnetic Insight (https://www.magneticinsight.com/) and Daniel Smerin for their support in conducting our experiments. Disclosures: Gary Steinberg—UNRELATED: Royalties: Peter Lazic US; Stock/Stock Options: Qool Therapeutics, NeuroSave, Comments: stock options only from both companies. Tim Doyle—UNRELATED: Payment for Lectures Including Service on Speakers Bureaus: Magnetic Insight, Comments: talk presented at a magnetic particle imaging workshop at the 2017 World Molecular Imaging Congress (Philadelphia). Honorarium was paid. Steven Conolly—UNRELATED: Grants/Grants Pending: National Institutes of Health, University of California, Office of the President. * Max Wintermark—UNRELATED: Board Membership: GE NFL Advisory Board; Stock/Stock Options: MORE Health, Icometrix; Other: Equity, Comments: Magnetic Insight. Kannan Krishnan—UNRELATED: Grant: University of Washington. * *Money paid to the institution. Accepted after revision July 6, 2018.